Murder by Gaslight: Curley Confesses. 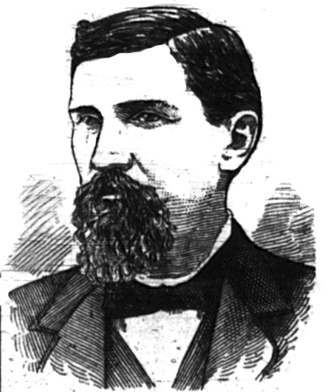 (From Harrisburg Patriot, July 12, 1877). Miss Whitby’s Murder—The Result of a Bloodthirsty Impulse. “Thomas Frances Curley, who has been sentenced to hang at Norristown on the 9th day of August next for the murder of Mary Ann Whitby, near the Trappe, in May 1875, has made a full confession of his terrible crime to his counsel. At his trial Curley was convicted on purely circumstantial evidence, and doubts existed in the minds of many persons as to his guilt, but these are removed by the startling statement which has been made to his legal advisers. Though the facts were known to his attorneys some time ago, they have just been made public, and though it is denied by the counsel, it is generally believed to have been made in order to have the death penalty commuted to imprisonment for life. This belief is strengthened by the fact that, at the meeting of the board of pardons at Harrisburg, today, Curley’s case was postponed until the September meeting, and thus a new lease of life is given the condemned man. “From the meagre facts that can be obtained, Curley, in his confession, states that he has had an insatiable desire for blood form childhood up; that he had previously inflicted unnecessary cruelty to dumb animals—stuck a penknife into calves, in order to see the blood flow, and committed other inhuman acts. In the killing of Miss Whitby he says that a desire to murder her seized him on his way home to dinner and that he struck her with a hoe handle and not the stove lifter, which was believed to have been the instrument of death from evidence give at the time of his trial. He states that no words passed between them; that no quarrel took place, but he came directly home from the field, secured a hoe and dealt her the murderous and fatal blow. "If anyone takes a human life, that person's life will also be taken by human hands. For God made human beings in his own image." Genesis 6:9 / No waiting on death row for 20 years...no pardons and paroles...death for the murderer. This is not unkind or merciless, this is enacting God Almighty's command. If the world practiced this commandment murder would be far less than it is. 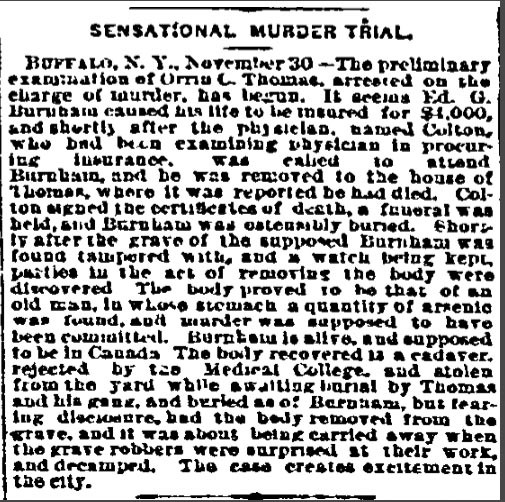 Almost overlooked this one, Bob.....it happened around 4 1/2 miles from where I live....Had Curley lived in a city, he may have become another Jesse Pomeroy or adult serial killer. Thanks for posting it. Yet, it is above all our commandment & duty to follow after the law as clarified & refined by the divine faculty of Logic & by its embodiment as incarnate Symbol, The Logos, Who is that aspect of God That is Jesus Christ, Our Lord & kin in form. By That, by Him as His Word, we are to forgive rather than condemn, empathize rather than hate, & have the exquisite mercy & grace to meet destruction, affrontery, evil itself in all forms, with but a turn of the cheek, & a prayer for the one who dealt the cruelty, by understanding lifted above the mortal sphere, to the highest & most elegant forms of mathematical truth, which indeed demonstrate that a broken mirror is not repaired with further breaking, but only with the perfection of understating & patience to enable it to resolve fibre by fibre into its original form, be that shattering minute or catastrophic, be the moments toward redemption of its true & full form fleetingly temporeal or infinitesimal.